As a member of BBC Good Food Middle-East’s Food Club, I was invited to a cooking masterclass at Kempinski hotel in Ajman last evening. Usually, most interesting events like this tend to happen in Dubai and I end up not going all the way. When I heard that this one was closer to home, I jumped at the chance! 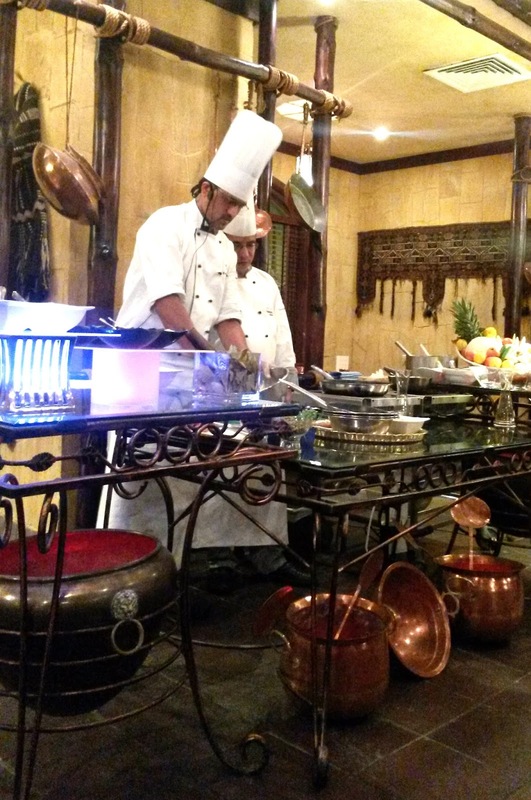 The event was held at Bukhara, Kempinski’s Indian restaurant which serves up delicious north-west frontier fare. 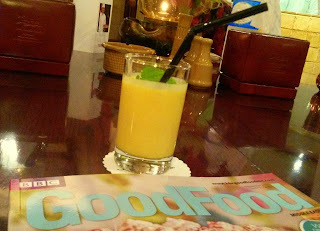 Sipping on our chilled glasses of mango lassi, we got to learn 3 recipes from Chef Manoj Aswal. 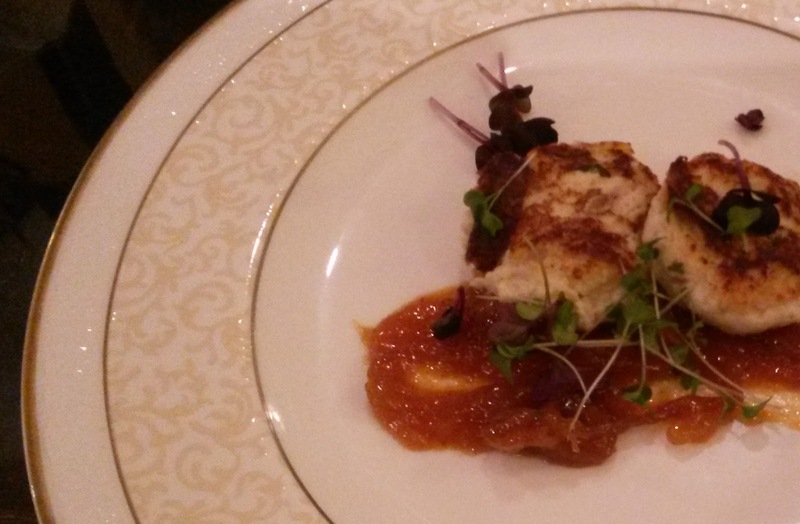 He started off with a very innovative Dahi Ke Kebab with raw mango and onion chutney. When I heard the name of this dish, I assumed that the chef would be marinating pieces of meat with yoghurt (dahi) before grilling them into kebabs. However, he totally surprised me by making kebabs out of yoghurt itself! One would imagine that the yoghurt would disintegrate and fall apart, but he added a secret ingredient to avoid this - roast and ground lotus seeds! Really different! This was followed by the ubiquitous Chicken Tikka, which was served with raw papaya relish. The chicken was tender and juicy. Scrumptious! 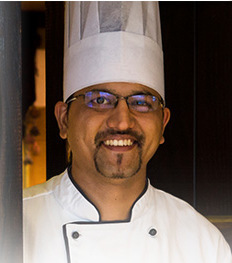 Chef Manoj explained how we can incorporate the trademark smoky flavour of tandoori cooking at home, where most of us don't own tandoors. Want to know how? Simply ignite a piece of charcoal, add a dash of ghee (clarified butter) to it, place it in a heatproof ramekin and place the ramekin into the bowl of marinated meat. Cover and let it sit for about 30 minutes to allow the meat to marinate and the flavours to infuse, before proceeding with the cooking process. Voila! The demo was wound up on a sweet note with a tasty and crispy Saeb Ki Jalebi. 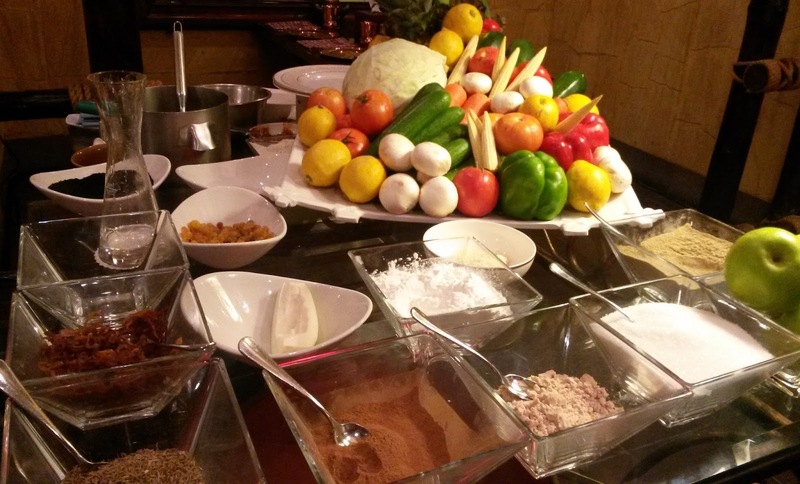 We were given samplings of the 3 dishes – my favourite was the dessert, but the other two were pretty good too.Chef Manoj Aswal was very helpful in addressing our queries and shared several tips and tricks for cooking Indian food. 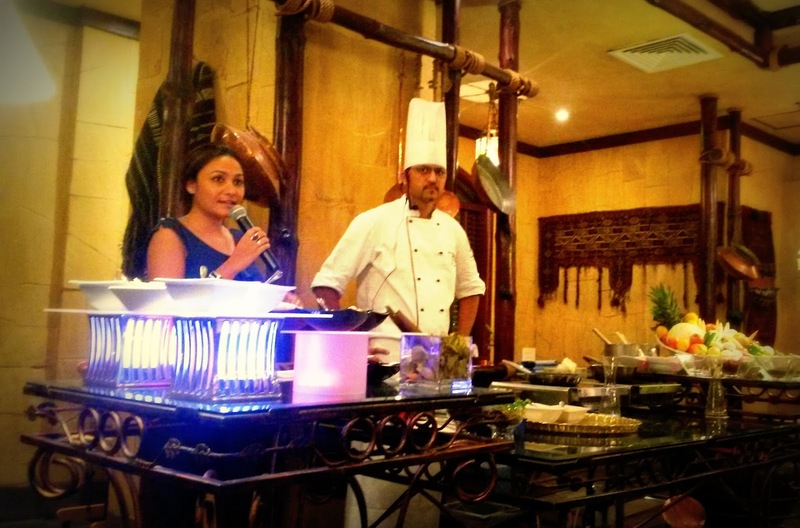 The dishes demonstrated were simple with the perfect balance of traditional and contemporary flavours. 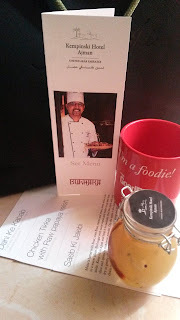 All participants were given goodie bags which contained a copy of BBC’s Good Food Middle East magazine, a jar of raw papaya relish, printed recipes of the 3 dishes and a bright red coffee mug, which proudly proclaims, "I'm a foodie!". I am definitely going to try out the dishes at home and I am indeed looking forward to more such great events! 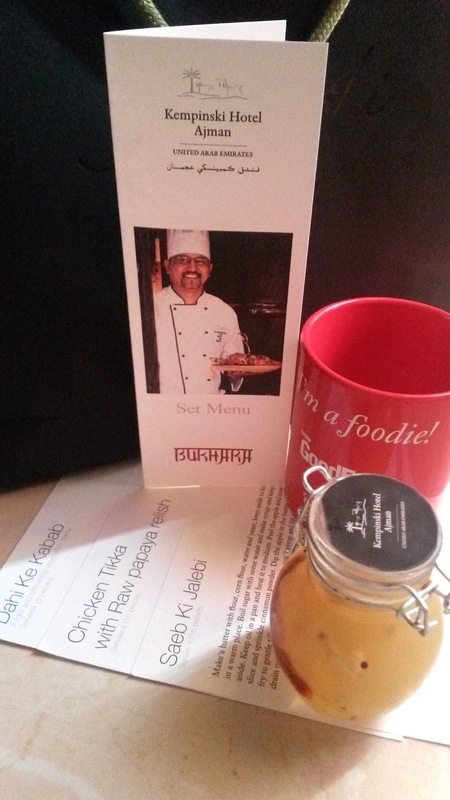 If you are around the Ajman area, do consider dropping by Bukhara for a mouthwatering Indian feast. I'm sure you won't be disappointed!